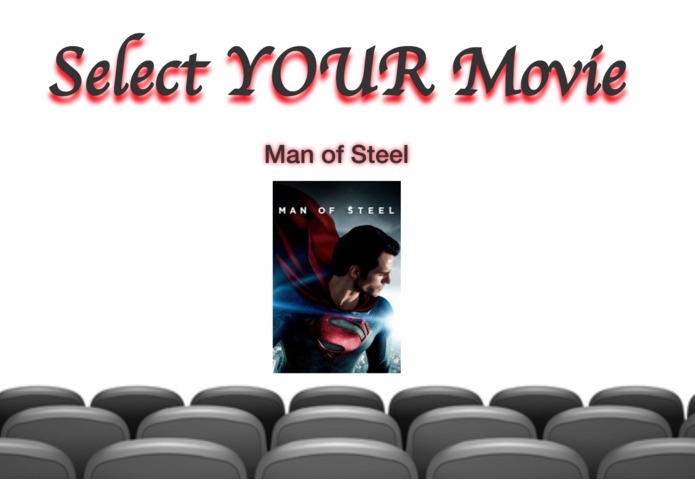 Movie Choice Confusion? 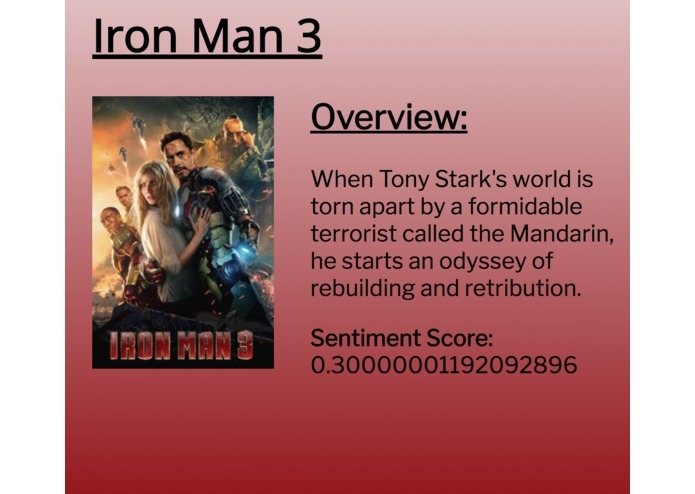 CinemaSentiment can tell you exactly which movie to choose based on an overview connotation. We wanted to work with NLP is some way, work with multiple APIs and have a project with ways that new Hackers could contribute. 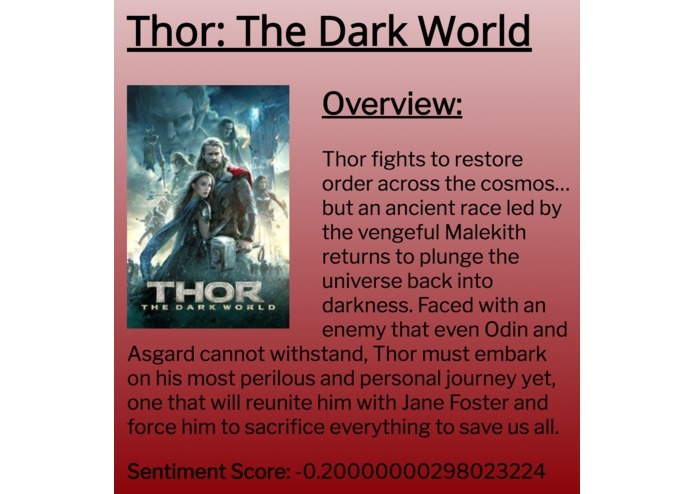 CinemaSentiment takes user input of a genre and year, renders movie choices for them and compares their two choices using a NLP google cloud API that generates sentiment scores based on movie overview connotations. Starting a project with three first time hackers who had a vague understanding of python and how a complete web application is built, offered a great opportunity to learn, but also required consideration of a feasible project. Through batting Windows python and flask installations, to learning Git and figuring out how to stay up for the duration of the Hackathon, we were challenged a good bit! CinemaSentiments is wonderful because it incorporated contributions from all of our teammates. One of our members went from not knowing HTML to being able to render a complete webpage using flask. Everyone walked away with a greater understanding of how to build a web application and a new found excitement to attend more Hackathons to develop their skills even further. We learned how a Hackathon operates, that we can be self sufficient learners, and that NLP can be used with movies to give insites on data. I set up the flask backend, managed all the API calls, and helped with the front end design and implementation. I loved being a mentor for some first time Hackers! Worked on front end web development and learned HTML CSS. Also learned about python rapid web development and flask, and how web development works. I contributed strongly to the overall product features through design thinking and brainingnstorm. Also helped created wire frames for the process flow. I worked on the front end development and learned a lot about html, css, flask, and integrating frontend and backend development. Definitely a successful first hackathon.